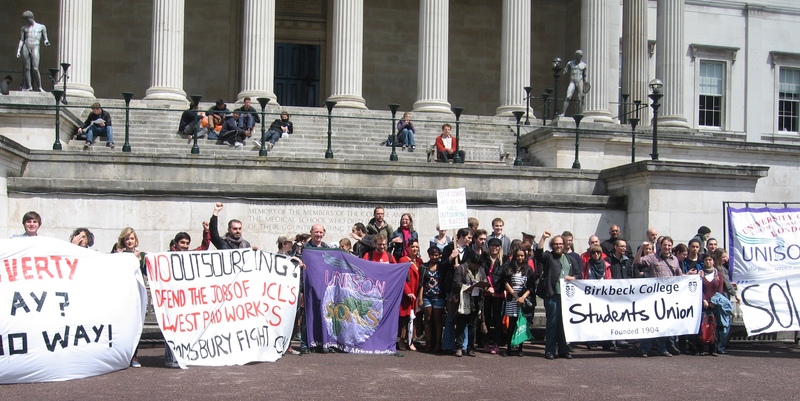 Staff And Students Protest Against Outsourcing Injustice | Bloomsbury Fightback! Around 100 staff and students from across the Bloomsbury campus came to protest in the main square of UCL today, against management’s ill-advised and unjust plans to outsource 96 long-serving staff. Outsourcing to a private contractor would mean less pay, less control over working hours and no job security for these workers. Collectively, they have given 1,250 years of work to UCL – and in return are being treated with contempt. The Union meeting scheduled for the beginning of this week was cancelled by management at the last minute, and the feedback staff gave during the 20-day consultation period has still not been given a response. During a well attended rally in the quad one cleaner, who has worked at UCL for 26 years, spoke of her anger at a management team who have only a few years collective experience. Unison representatives emphasised that though this may be an attack on cleaners and security staff today, management have implied that their plans extend to all support staff, and that the fight against privatisation and for job security is a fight for all university workers. Student speakers spoke of the gross attitude of management towards the use of their finances, and the precarity of the job market for future graduates as much as for current support staff. Speakers at today’s demo included workers from UCL and SOAS, as well as students from UCL and Birkbeck, and union representatives from Unison and UCU. An emergency general meeting of the UCL Unison branch is scheduled for Tuesday at 7.30am and Wednesday at 1pm, including a motion on an indicative ballot for industrial action to oppose the outsourcing. « Protest against UCL Outsourcing!